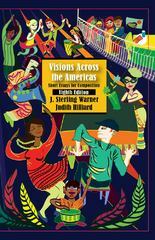 Visions across the Americas 8 Edition Louise Erdrich, Amy Tan, John Steinbeck, Pat Mora, and Andrew Lam are among the authors represented in Visions Across the Americas: Short Essays for Composition, 8th Edition. The book's 72 cross-cultural essays (12 of them new) cover a variety of themes--from cyberspace, humor, and popular culture to ecology, politics, and work. Writing guidance includes an overview of the writing process, writing tips, pre- and post-reading questions that reinforce understanding of the rhetorical modes, and optional activities on conducting research online and documenting sources.